The OM-USB-32DIO provides 32 bits of high-speed digital I/O, and features independent input and output scan clocks, hardware and software triggering, and pattern detection/generation. The 32 DIO bits are available as two 16-bit ports that are bit-configurable for input or output. Each port is configured independently, so both software polling and hardware scanning operations can be performed at the same time. When performing software polling, the port can contain any combination of input or output bits. When performing hardware-paced output scans, all bits in the port must be set for output. For input scans, however, the current state of any bits in the port that are configured for output are read. Either port can output a 16-bit digital pattern. The pattern is updated at a rate up to 8 MS/s, and clocked using the output scan clock. Use both ports to output a 32-bit digital pattern. Data from one port is read and stored in the FIFO buffer until the second port is read. Both ports are output simultaneously on the rising edge of the next pacer clock signal. The OM-USB-32DIO uses a delay between the output scan clock and the data transfer pin, which allows an external device that is receiving the data to know that the data is stable at that point, and ensures a coherent data transfer between devices. The DIO bits can be pulled up to 5V or down to 0V through 47 kO resistors via onboard jumpers. 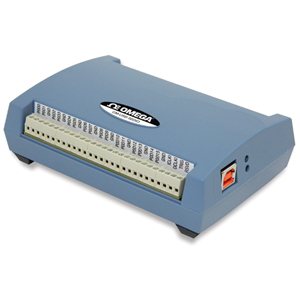 Users can pace input scanning operations with the onboard input scan clock or with an external signal. The input clock frequency is 8 MHz, maximum. A duty cycle of 50% is maintained when the internal input clock paces operations. When using an external clock, the signal is output immediately after the external clock input is received. Digital and pattern triggering are supported. The TRIG pin is used for external TTL level triggering, and can be used to trigger input or output scans. Trigger latency is less than 1 µs. The trigger mode is software-selectable for edge or level sensitive, and high or low logic. Either digital port can be used for pattern triggering. A scan is triggered when a specified pattern is detected. Specific bits can be masked or ignored. Trigger latency is 1 scan clock period. You can input or output a digital pattern under the timing control of a clock signal. The OM-USB-32DIO module ships with an impressive array of software, including TracerDAQ®, a full-featured, out-of-the-box data logging, viewing, and analysis application. Driver support and detailed example programs are included for Universal Library programming libraries for Microsoft® Visual Studio® programming languages, and other languages, including DASYLab®, and ULx for NI LabVIEW® (comprehensive library of VIs and example programs compatible with 32-bit and 64-bit LabVIEW 2010 or later) and InstaCalTM installation, calibration and test utility-powerful solutions for programmers and nonprogrammers alike. These modules operate under Microsoft Windows® VISTA/7/8/10 (32-bit and 64-bit) operating systems. Nota: Comes complete with 1.8 m (6') USB cable and software and operator’s manual on CD.